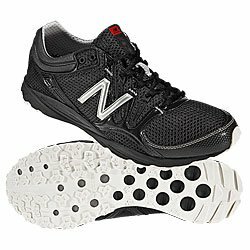 Thanks to Donald at Running and Rambling and his crazy December of contests, I was the recipient of a pair of New Balance's new minimalist trail shoe, the MT101. I have to admit, as soon as I unpacked the box and took a look at them, I was skeptical. The shoes look and feel like nothing more than a light, racing flat-style upper with possibly a slightly stiffer sole. I couldn't help comparing them to my lightest shoes, a pair of Adidas Adizeros that I've had for a few years. Looking at them side by side, the only obvious difference was that the MT101s had a bit less of a heel-to-toe drop. These really didn't seem to me like they would hold up to any kind of trail running. Since I didn't have any trail runs planned in the near future, I did a couple things with these shoes. First, I wore them to work for a day, to let my feet have a chance to get used to them. I find this is a decent thing to do with a new pair of shoes - not so much a break-in period as a get-acquainted session. Next, I wore them on an easy 4 miler on the roads where they felt fine, but not appreciably different from any other light shoe. I finally had a chance to try them out on the trail at a race - the Centennial Slug It Out 10K down in Carson City. The trail surface was pretty rocky, with sections of frozen mud that was rutted with mountain bike tires. It looked nasty, and I was a bit nervous as to how the shoes would perform. Apparently I needn't have worried. From the first step on the trail, these shoes felt at home. I never felt like I didn't have support or traction, and the lightness of the shoe made them feel like there was nothing there. Even the rocky pounding on the way back downhill was absolutely fine. The only problem at all that I noticed was a small bit of forefoot slipping - but I think that can be fixed with lacing or perhaps a different choice of socks. After the race, I slipped on what used to be my "light" trail shoes, a pair of Salomon Speedcross 2s, to go out for a few more miles on the course. They instantly felt heavy, and it took a mile or so before my legs were convinced to pick my feet up enough. I did not at all expect to be as impressed with this shoe as I am. In fact, it's changing my outlook on minimalist running in general - I was open to the idea but hadn't really got around to experimenting with it too much (outside of sporadic runs in a pair of FiveFingers.) I think now that my next road shoes will be something toward the minimalist side as well. Glad you like em. I think I'll dig mine quite a bit without the on-course waterfalls and tons o' mud. Very cool! I'm a fan of shoes with little or no heel-toe drop myself. Definitely helps the running form. Have fun with them, Turi! Hmmm.....might have to give these a try! I'm looking for an off road runner that is a good all around shoe for a variety of terrains. I'm competing in the Warrior Dash (warriordash.com) in June and may want a bit more than my road running shoes although I'm not so sure about getting some new nice shoes that muddy! got 3 pairs cached away in the basement. favorite shoe hands down! glad they worked well for you turi! hey by the way if you email me your mailing info again I got a 40% discount card for the outlet if your interested. good until mid april.